"I've been married four times, all deceased." Any Whovians care to parse that? Obviously Spouse No. 3 was Queen Elizabeth, and Spouse No. 4 was River Song. Spouse No. 1 was presumably an unnamed Time Lady who was the mother of one of Susan's parents. So... who was Spouse No. 2? Is it someone totally unknown to us... or have we seen her before? 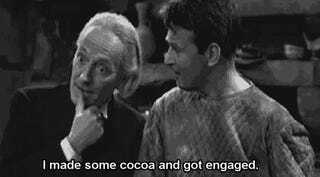 The First Doctor was engaged to the Aztec priestess Cameca in "The Aztecs," but they didn't tie the knot. The TARDIS is referred to as "The Doctor's Wife," and Idris, the TARDIS's human avatar, did die, but I'm pretty sure the "wife" part is figurative. Given the near-total absence of known romances in the Doctor's life between his First and Ninth incarnations, that doesn't leave too many people... but I do have my theories. For the record, I don't think it was Sylvia Anderson.